It may feel like voice assistants are being built in to everything these days, but so far musical instruments have been largely overlooked by companies seeking to make traditional ‘dumb’ devices smart. 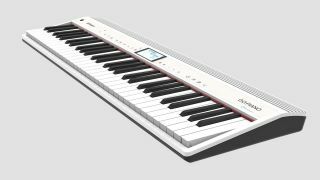 It looks like that's about to change though, as keyboard manufacturer Roland has announced at CES 2019 in Las Vegas that its new GO:PIANO will have Amazon Alexa built in. The inclusion of the smart voice assistant means you'll be able to change the keyboard’s sound and settings without ever taking your hands off the keys, via a new Roland Alexa skill. As well as offering hands-free adjustment, the new Alexa skill will also provide access to libraries of ‘play along tunes’, plus the ability to share recorded clips of your playing to friends and family. Alexa can also become your piano tutor, with one feature of the skills allowing it to play along with you as you learn; when learning a new song, Alexa can take one half of the keys while you take the other, as well as allowing you to view your progress all the time. Roland says it will also be adding new features to the Alexa skill over time, and will be looking to make it compatible with other instruments. While there's no official information on price and availability, the company says the new GO:PIANO with Alexa built in will be launched in late 2019. Whether Alexa could feasibly replace traditional teaching methods is uncertain; after all, a huge part of learning an instrument comes down to a successful and nurturing student-teacher relationship. Still, as voice assistants become more and more advanced, your next music teacher being a bodiless, cloud-based virtual assistant is not outside the realms of possibility.